Chronic pain affects millions of people and can easily make a sufferer feel like he or she is going crazy. Finding an effective treatment for chronic pain relief usually involves a combination of medication and physical therapy, but Thimble Bioelectronics is developing an easier way to find relief. 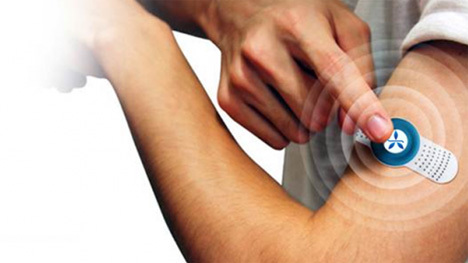 Their stick-on pain relief patch uses Transcutaneous Electrical Nerve Stimulation (TENS), the same low-power electrical shocks used in physical therapy to relieve certain types of pain. TENS therapy is typically delivered with the use of a small machine and several stick-on electrodes. But the patch being developed by Thimble Bioelectronics sticks on the skin like an adhesive bandage, allowing the wearer to administer his or her own pain relief when it’s most needed. The patch will come with Bluetooth connectivity and pair with a mobile device. A special app will track the user’s pain and pain management. Although the device is still quite far away from hitting the market, the concept was a finalist in the Wearable Technologies Innovation World Cup.